For years I've had an old LXD55 mount - most folks laugh when they hear about my mount - but I've made it do most of the things I want it to do. I've just dug up some comments I made in 2006 relating to periodic error that I'd like on the web, so i'll put them here. They relate to a "magical" adjustment that I made to my mount that gave a large improvement to the autoguiding and tracking and periodic error of my LXD55 mount. I've owned my LXD55 mount for a number of years, and have ripped it apart and hypertuned, tefloned, belt driven, re-dovetailed etc etc. This mount is very much a bog standard EQ5 telescope mount. My permanently lxd55 mount gives satisfactory astrophotographic results used with my "Helios" 8inch F5 newtonian when autoguided with a 400mm refractor and an SC1 toucam webcam. Now, my point. You'll notice that M51 from earlier this year is fairly well tracked. In England imaging is difficult during June/July due to the lack of astronomical darkness, therefore during those months I completely dismantled and serviced my mount. Once I re-assembled my mount, I was dismayed to find it did not track as well as before the service! Periodic error was high, jerky, and the autoguiding could not cope. I spent a lot of time re-adjusting worm gears etc, but I could find no improvement. Then I had a recollection. 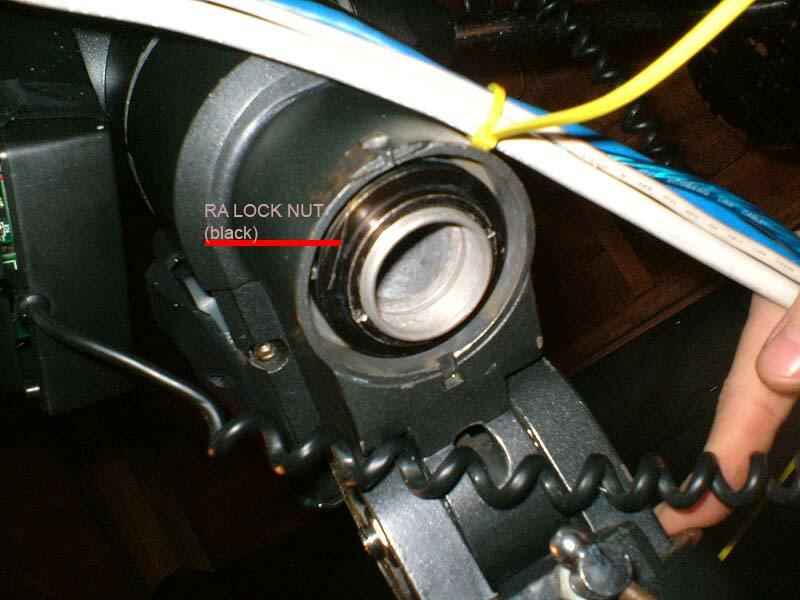 When I dismantled the mount in June, I noticed that the large black nut that locks the RA axis in place was quite loose. I could "lift" the axis up by a few mm. Obviously, when I re-assembled the scope, I tightened this up so the shaft rotated and it felt "right". Bearing this in mind, one night a few weeks ago, I loosened off this nut by a turn. This means I can "wobble" the RA shaft inside the housing, but there is so much weight on the mount, I do not see any risk of it collapsing, especially here at 51 degrees north. Magically the tracking improved to pre-service standards. Once again I was able to make autoguided exposures of several minutes at an image scale of around 1.2 arc second per pixel. The images of the Iris and NGC7331 demonstrate this well, infact, tracking is now limited by the flexure in the system - mainly due to my poor mounting of my homemade focuser on the OTA - but that is another story - hence the less than perfect stars in the above images. After a lot of mucking about trying to pin down the flexure issues, my optical alignment has suffered. I am not sure why this "works" - but it transformed an unusable mount back into a well behaved scope. I do not have "before" and "after" graphs of the PE, but I thought I would mention it. I do not know if it will work for anybody else, and might just be an artifact of the modifications I have made to my scope over the years, but no harm in somebody trying it. Go on - try it on your EQ5 mount - it is not that scary!